Vanishing Austin is my photo homage to Austin’s irresistible scenic gumbo. Since 2004, I’ve been trying to stay ahead of the wrecking ball by photographing Austin’s architectural eye candy, landmarks and icons, with more than 99+ images to date. What’s been lost, and what remains, is immortalized in print in my signed, limited edition prints at my Vanishing Austin shop. But a lot of Austin has gone missing since I began my Vanishing Austin photography series in the summer of 2004, before Las Manitas (right) was overtaken. For one reason or another—losing their leases, making way for condos, hotels, chains and office buildings, relocating for cheaper rents, gentrification, new urbanism trends, losing a long-time customer base, or owners just being plain tired of the way things are now—there are about 30 Austin landmarks in my photography series of 99+ that live on only in memories and print. See all 99+ Vanishing Austin prints HERE. A poster of some 16 of Austin’s then-revered icons (above), that I created in 2006 and somewhat fliply called the Endangered Species of Austin, became prophetic when half of them actually did vanish. 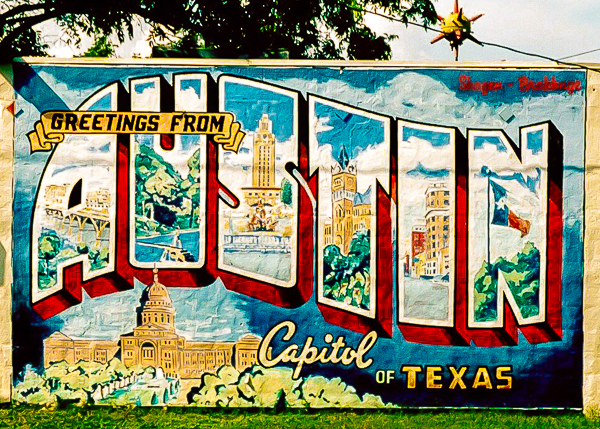 What I prize most about Austin is its funky, creative, all-embracing, vibrant, imaginative, come-one-come-all style, looks and attitude. When we lose one of these unique little landmarks, one that may not even be all that notable or known, it’s as if a little piece of Austin’s creative soul has vanished, too. Shop the Vanishing Austin series HERE. Buy the Poster HERE.